EN The older I get the more I understand the importance of basic pieces in my closet. When I was a teenager and even few years ago I used to buy things without even thinking if I will have something to pair it with. Most of the time I didn’t have. So it lead to long and exhausting searches to find something to pair my new purchase with, and that’s how I every time ended up not wearing that thing at all. Little by little, or because I get wiser and wiser I started thinking before buying a thing. -Will I wear it few times? -Will I have something to pair with? These are my questions I try to ask myself before getting a new thing. It’s my own conscious consumption. Yes, I still break down from time to time and I think it’s totally okay. 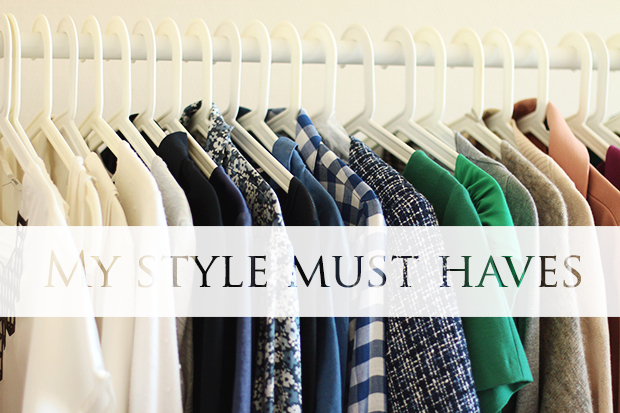 The point of this post is to show you my style mush haves or in other words my style basics. It’s important to have few basics that help you to play around with other clothing. I don’t agree much that you need to pay more for the good basics, speaking from my experience you can get a good deal and good quality at the same time. It simply takes more time to find great quality for a reasonable price. LT Kaip sakant, su amžiumi pradedi suprasti daug dalykų, tame tarpe ir savo spintos turinį. Kai buvau paauglė ir netgi dar prieš keletą metų pirkdavau drabužius net nepagalvojusi, ar poto turėsiu juos su kuo suderinti. Deja, dažniausiai grįžusi namo nerasdavau nieko tinkamo prie savo naujo aprėdo, tad tekdavo keliauti į parduotuves ir ieškoti vėl naujo daikto, derančio prie neseniai pirkto, tarkim, sijono. Arba nepavykdavo rasti, arba atsibosdavo tos paieškos, tad nugrūsdavau tą gražų, bet priklų sijoną į spintą. Taip kaupėsi nenešiojami drabužiai. Tačiau po truputį arba tiesog augant ir protingėjant išmokau pirkti daiktus prieš tai gerai apsvarstydama. -Kiek kartų aš užsidėsiu šį rūbą? Ar tai vienai progai, ar galėsiu panaudoti daugeliui progų? -Ar pajėgsiu ir ar turėsiu ką priderinti prie naujojo pirkinio? Štai tokius klausimus stengiuosi sau užduoti prieš pirkdama kažką naujo. Čia yra mano savotiška versija sąmoningo vartojimo. Taip, žinoma, kartais ir aš palūžtu ir keliai sulinksta, ir spjaunu aš tuos klausimus, na bet juk kartais galima. (Ir reikia, mirkt mirkt ;)) O šio įrašo tikslas yra parodyti jums mano spintos būtiniausius rūbelius, be kurių nė iš vietos. Nesuntinku, kad vadinamiesiems “basics” reikia išleisti daug pinigų. Iš savo patirties žinau, kad galima juos rasti geros kokybės ir už prieinamą ir protui suvokiamą sumą. Gal tik kartais reikia ilgėliau paieškoti, bet tikrai tikrai įmanoma. Na baigiu pliurpti ir rodau savo spintos būtiniausius! 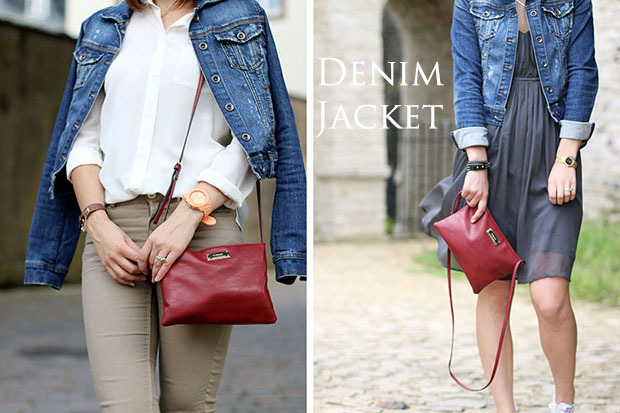 I have this denim jacket from Stradivarius for ages and I love it so much that I don’t even search for another one. Its classic cut and color never goes out of style, it wasn’t expensive and it has a great quality and I tend to wear it mostly over everything. Chunky sweaters are very useful when it’s cold or chilly outside. When I wear chunky sweater I tend to opt for skinny jeans, mini skirts, you know just tighter lower body. In my opinion, it looks way more flattering. I have to admit it’s not so easy to find the right chunkiness and not to look like a huge potato bag, but when you do, don’t hesitate, get it, you will be happy! Truuuust me! Oh this clothing can save you from many situations as it did for me. It looks great with ripped black, blue jeans, printed skirts, it goes literally with everything. Add few delicate accessories or go for statement necklace and here you have: a stylish outfit without any efforts. I got my white sweater from Mango. 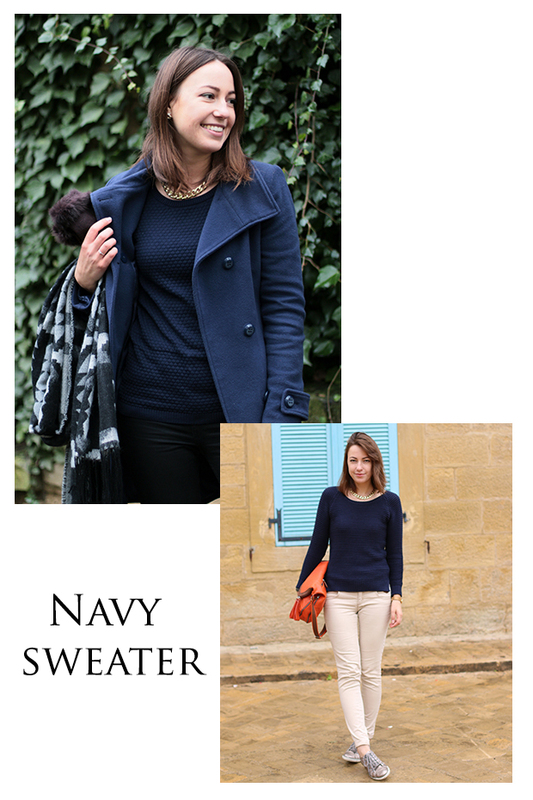 Navy sweater is a must have in every Parisians closet and I totally get it, because it’s just a classic piece that will never go out of style and it’s easy to style with, for example, white pants, ballet flats and statement necklace. Perfection for me! Just like white sweater, white blouse and t-shirt are so versatile. You can build your white t-shirt or blouse how you want. It’s a piece that I couldn’t imagine my closet without, like seriously, I couldn’t. I have different types of white t-shirts and blouses, but I always look for a new one, because it’s never enough for me. It’s my go to pants during the autumn/winter season and when it’s chilly in the summertime. Simple, chic, you can never go wrong with them! 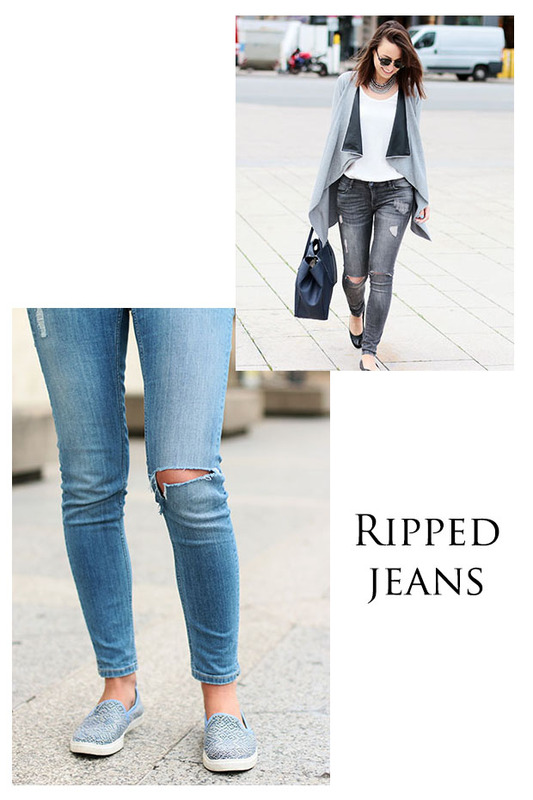 My top jeans for summer! I know people wear them during winter too. I agree when it’s warm and dry, but most of the times here the winter is with rain and snow. 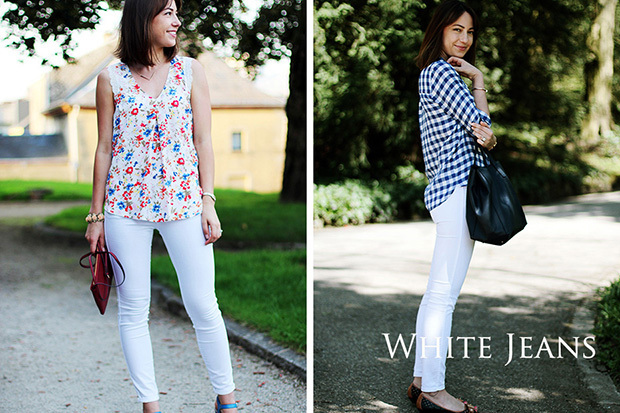 White pants is not the best choice, so I leave my white jeans for summer season when I wear them a lot! Now I’m thinking about getting ripped white jeans for the next season, oooh gosh, so beautiful! These are my favorite. I have in grey and regular blue color and it always gives that extra stylishness to my outfit without doing anything. You just have to find the perfect fit and when you do, just rock it! If you want to dress like a parisian, you must have LBD. But it doesn’t have to boring. I have few black dresses and they all have some nice details, like a pleated back or laced shoulders. Again black doesn’t have to be boring! After all stuff above in white, black and blue colors, it’s important to have few things more colorful. Because it’s fun, because it makes up your mood, because life is beautiful (maybe doesn’t make sense for you, but for me colors+life= life is beautiful :))) The most important thing is to find the right bright color that suits you the best. In my case, it’s green. I am happy when I wear it and it somehow manages to boost my self confidence, crazy, right? 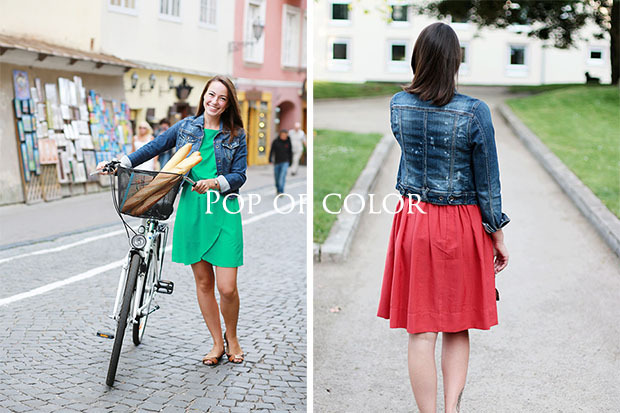 So don’t be afraid of a pop of color in your wardrobe! Dressing should be fun! Would be nice to know your favorite basic pieces of your wardrobe!!!!!!! I’m looking forward to your comments! Dekui, Egle!!! Puikus tavieji must have! Galima sauniu ir stilingu variantu is ju isgauti!! I noted that things I bought when I was younger and I was living on a small paycheck lasted in my wardrobe more than those I tend to buy now.. Not sure it is a problem of quality or that I normally buy all the same kind of stuff so I get bored soon! I will try to be more conscious during next shopping trips!